I recently attended a Rachel's Vineyard retreat and it has taken me some time to digest all that took place that weekend. I want to thank each of you that played a part in my healing. What an amazing transformation to my mind, body and spirit. Your work and all that you do displays God's mercy and forgiveness in such a tender way. The safe, loving environment you created made it very easy to face my fears and mistakes. I wholeheartedly felt God's loving forgiveness, which finally allowed me to forgive myself. My load is so much lighter now! I thank each of you for the part you played in the weekend and am truly grateful that each of you is answering God's call to serve in such an impactful way. Rachel's Vineyard has changed my life! Before I went to the retreat, I was so depressed. I felt lonely in my depression and grief. I felt as if I were not allowed to grieve because I had had an abortion. I had been having nightmares every night for the past two years before my first retreat. I didn't know who God was, or what faith was. Now, I am devoted to prayer and have a strong faith in the Lord. My nightmares went away along with my depression. I met so many wonderful women and men in my group, and I am still in contact with many of them! I know that I am not alone. What I took from that weekend was wonderful. I have such a strong bond with my child - I know I am a mother, whether my child is on earth or not! My husband and I got his name engraved on the "Holy Family" plaque for babies lost. We go to visit him all the time. Thank you for creating Rachel's Vineyard. It really does touch so many women's lives, as well as men! It helps so much to heal and strengthen the soul after abortion! I don't know where in life I would be now if I hadn't found out about Rachel's Vineyard. I appreciate it and I know many others do as well! Thank you! 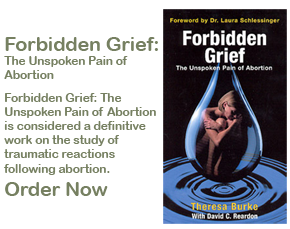 For 12 years after my abortion I suffered in silence, grieving the loss of my child. My life became a living hell, and I didn't care if I lived or died. In October of 1997 all that changed. I attended a Rachel's Vineyard Retreat and began my journey of healing. Not only did God remove my fear, He has also allowed me to have tremendous love and support from my family and friends. I am now able to carry the message of hope and healing to others who have suffered after abortion. I have tried over and over again to verbalize the glory I experienced on my retreat at Rachel's Vineyard. Trying to use words to explain the miracle that happens within your heart is difficult indeed. For how does one explain the power and love of the Lord's mercy as His tender hand extends from the heavenly throne, mending my broken heart and making it new? When the Lord touches a contrite heart, the capacity to love, trust, and hope is unimaginable. How could I explain the feeling of peace that engulfs and sustains my heart with a peace that surpasses all expectation? How could I explain the abundance of gratitude as I realize for the first time that calmness in my heart, no longer experiencing constant fear, anxiety, and condemnation? How can I describe that in 48 hours, I became reconciled with my Heavenly Father? The process of healing can only begin through forgiveness and acknowledgement of my choice to abort my precious baby. And now, I have the greatest gift of all: the right to acknowledge, name, baptize, grieve, and give dignity to my first beloved child. I attended a Rachel's Vineyard retreat this year and the healing I have experienced as a result has changed me deeply and fundamentally. I not only found God's forgiveness but He made it possible for me to forgive myself. Healing is possible. There is hope. A part of me died when I had my abortion and God's healing is restoring me. The Rachel's Vineyard Retreat restored my life. I feel whole again, alive and capable of love. Before this retreat I was spiritually dead. I was empty inside . I felt separated from the church and from God. After this retreat, I now feel alive, and happy to be alive. I feel the love of God inside me. I heard about an extraordinary organization called Rachel's Vineyard, which is doing work for those of us who have been hurt by abortion. It was as if everything they do was meant for me. They understood the pain and the shame that accompanies post-abortive women. I had given up on myself, and thought that I had nothing else to offer anyone in life. I had tried all types of counseling and therapy and nothing worked for me. I was very scared and apprehensive about coming to Rachel's Vineyard and having to share my story. It was the best experience of my life. I feel like a new and stronger person now, and am ready for anything life has to offer me. I had received previous counseling but nothing could prepare me for how I felt after attending the Rachel's Vineyard weekend. It was like a light had been turned on in my life again. I came out of the darkness and into the light. A great weight has been lifted from my shoulders. I was finally able to grieve for my baby without feeling the guilt that I had been carrying around for so long. My baby existed. Rachel's Vineyard has helped me to move on with hope. When I met other women who had abortions and had suffered just the same as I had, I didn't feel so alone anymore. The healing I experienced on the weekend was amazing and is still ongoing. Words could never be enough to explain the gratitude that I feel for having the opportunity to attend a Rachel's Vineyard weekend. For the first time in years, it feels good to be ME. I have a huge sense of peace and happiness with myself and also with Jesus. I met such lovely people who had the same experience as me, and who did not judge me. When I went back to work people told me that I looked different. I looked so at peace with myself. Rachel's Vineyard has saved my life. Before attending Rachel's Vineyard retreat I was secretly suffering from severe depression, because of my abortions. Making the initial phone call was difficult, but when the counselor told me that she was post-abortive, I felt she would understand me and not judge me. Before the weekend I started to panic because I hadn't been totally honest with her. So I decided to tell her via e-mail that I had two abortions. She e mailed me back and said that she was so looking forward to meeting me. I was a little taken aback as I was sure she was going to send me an e mail which tell me in a polite way that maybe I wasn't welcome. During the first evening when the women began to share their stories, I was so amazed at the honesty of the women, they just bared their souls. When my turn came I was so eager to get it off my chest. I never thought I would have the strength to say it. The shame and the pain that I have felt for so many years is passing. I am hopeful for the future. The black cloud has lifted. Rachel's Vineyard is a safe place. I am so glad that I came. I really feel privileged to have done a Rachel's Vineyard weekend, and that God has led me there. I feel so much less burdened, and I feel that I can now let go of the past and live again. I wish I had heard of Rachel's Vineyard years ago. I took my daughter to England for an abortion. I thought that I was saving her from a life of misery. How wrong I was. My daughter has never been the same since. She began to drink heavily and take drugs. Her life is in a mess. When I heard of Rachel's Vineyard I knew that I had to come. I was allowed to share my pain in an emotionally safe environment. I was allowed to grieve the loss of my grandchild, and express the shame, the guilt and despair which have been such a heavy burden to carry. I now feel so much peace in my heart. I know that God has forgiven me. I have a new hope in my heart. I found out that my daughter had an abortion. I was devastated, and felt so guilty. Why didn't my daughter come to me when she was pregnant? What had I done to prevent her from trusting me with her secret? I watched her change before my eyes. She was not the same. I tortured myself with guilt. When I heard of Rachel's Vineyard I just had to give it a try. I was amazed at the kindness and compassion that I experienced on that weekend. I was allowed to share my pain and grieve the loss of my grandchild. Words cannot express how grateful I am to have had the opportunity to come on the retreat. I was so lost, sad, alone, and afraid. I now see hope, joy and happiness. God was present every step of the way. The retreat was excellent, successful and life saving. The retreat was very productive in guiding me through the questions and negative feelings that I have experienced. The retreat staff was very sound in answering the questions and explaining where the negative feelings come from and how to end those negative feelings and replace them with positive spiritual energy. This experience released feelings of grief and sadness that I had repressed for so many years and even never knew I had. The support and sharing helped so, so much to acknowledge and move through the grief. I feel forgiven and at peace at last. Thank you!!! This retreat has been the best experience of my life. I wish that I had attended this retreat sooner. I was afraid to come because I had 3 abortions. I was afraid I would be judged that I had killed 3 children. I felt safe, loved and accepted. I was finally able to forgive myself and release my hatred toward God. You must come in order to finally heal. Please come. This retreat has been a gift and has helped me immensely in my grieving (delayed 24 years). It is helping me to live and love from this day forward. Thank you! This was one of the most memorable experiences of my life. I will never forget. My first impression was how organized it all was and how many special touches there were throughout the three days. The sincere concern and kindness showed through in every detail. It was truly a labor of love, and now I will take this love and spread it out into the world. I would not have been able to achieve, anywhere else, the level of spiritual healing I have received this weekend. Incredibly meaningful -- freeing, uplifting -- after so many years of silence our pain could find release. I had an abortion when I was 21 years old. I was immature, selfish, and foolish. Over the years I never could completely forgive myself for this decision. No one knew about the abortion so I carried the shame and pain with me for years. Earlier this year I was doing some other healing work and I determined I had never forgiven myself for this decision. This spring I attended a Rachel's Vineyard retreat and dealt with the shame and pain of having an abortion so many years ago. With God's love, strength and the living scriptures meditations I was able to forgive myself and honor my daughter. If you have lived with the shame, regret and pain of abortion I recommend these retreats to heal your soul and truly be able to bring love to all your other relationships. For 24 years I suffered from my abortions. I thought time would heal all pain, but for years my pain remained. I lived with guilt, shame, depression, and grief. After 24 years I sought relief at a Rachel's Vineyard retreat. There I found total forgiveness in my Lord and Savior, and found peace for the first time in years. I can now remember my aborted children with fond memories and love. I am free from the guilt of my sin. The memorial service gave me the opportunity to pay my respects to my children. The respect I felt they never received. It helped me to lay them to rest in the arms of the Lord. After the abortion many years ago I suffered the most from the sorrow of being the cause of such a sin. I cried several times wishing I could undo what we had done. I sought forgiveness in the Lord and believe that I have received His forgiveness, but I had trouble forgiving myself. Many years later when I thought I was healed, we went to a Rachel's vineyard retreat. I discovered that I had not dealt with many feelings and emotions that I had buried deep inside myself. The retreat allowed me to make a connection with my son. The living scriptures paved the way for me to find forgiveness from my son. It also gave me the strength to let go of the guilt and turn my son over to the Lord. This retreat definitely helped me to find closure. We were all embraced with love the whole weekend. Being able to be honest, to express, talk about, question, and process things. A psychotherapist does not have the same effect. We are dealing with something bigger than psychological. The feeling that a mother has destroyed a child, it is between you and God. It's beyond psychological. It's spiritual and I had to deal with it on that level. I have been through 14 years of therapy and anti-depressants. I've confessed my abortion a hundred times. Just when I thought I could take the pain no longer, I found Rachel's Vineyard. This weekend literally saved my life. It was a very intense and powerful weekend. A lot was accomplished. I was amazed at the sense of support felt. For the first time, it was okay to talk about what happened and know that everyone has experienced the same feelings. The Living Scriptures are very helpful to restore peace. It enables us to face fears and overcome them, allows us period of rightful grief, mourning and presents a new starting point for living guilt free. I hesitated coming because I knew it was going to be intense and I wasn't 100% committed to all the religious concepts (or at least I was leery of them until I could see them with my own eyes). The Rachel's Vineyard retreat far surpassed all my expectations. I have never witnessed so much healing and relief from anything else I have experienced or observed. This retreat has been a life changing and spiritual awakening for me. It's allowed to come in touch with past losses and grief. I feel that any woman who has had an abortion should come to Rachel's Vineyard safe haven to experience healing and forgiveness. It was very meaningful to be able to meet people who understand my pain and losses. Everyone was so warm, loving, and accepting. It was the best weekend of my life. For the first time in 20 years I was able to share my grief, my guilt, my anger. I was able to mourn the loss of my baby. But most important I was able to believe that she now lives with Jesus. For a short time I could almost touch her and hold her and see her. For this, I will always be grateful. I felt Jesus calling, pulling me back. A feeling I can't forget or deny. Rachel's Vineyard is a gift, directly, in every detail, personalized from Father God, Jesus my Lord and at last, indwelling of the Holy Spirit. I feel his presence within me now for the first time in my life, actually. Rachel's Vineyard has diversified content and the very beautiful processing of emotions, especially for self-condemnation. There was an opportunity for self-paced unfolding and personal growth at my own speed. This retreat provides the ultimate opportunity for the Holy Spirit to at last be personally real. A great healing has come to me spiritually, physically, and emotionally. This has been one of the most memorable and wonderful personal events of my life. Had I not been here and participated, I would still be a wandering soul without purpose. Now I am on my new journey to peace and being filled with the Holy Spirit. I found most meaningful that God is truly forgiving, therefore, I can forgive myself. Also, all of our babies are God's creation and are happy in their eternal life in heaven waiting to be re-united with their mothers.